Today I spent the day in downtown Seattle, doing what every tourist would do. I went up in Seattle’s number one tourist attraction the Space Needle, I toured the Chihuly Garden and Glass, and I got a glimpse of the Seattle waterfront via guided boat tour through an Argosy Tour. I’d highly recommend getting a City Pass to see these iconic places in Seattle. 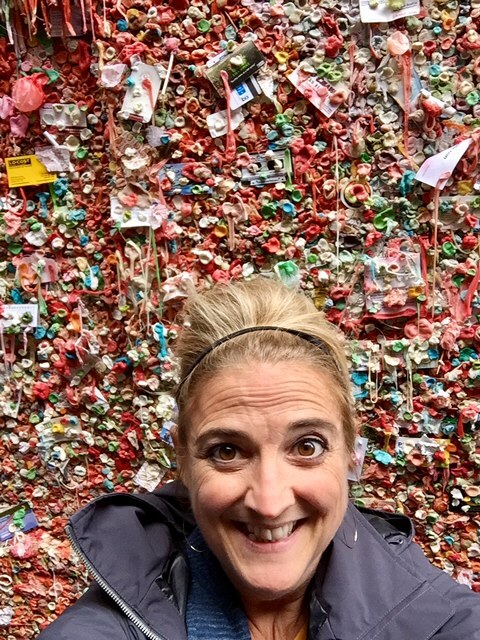 to the Seattle Gum Wall, pop a bubble while you’re there! So on top of an adventuresome day in Seattle, it was also World Smile Day. Did you know that? I, like you was shaking my head no. But hey, I’m in Seattle today so I’m going to smile at everyone I come across. So I did. People crossing the street, people taking a food order, people taking my money, people sitting across from me, you name it, I smiled. And not everyone smiled back. I found this curious. Mostly the people I encountered crossing the street were heading somewhere and seemed to be on a mission. There were business people, kids, families, students, and homeless people. Most of them did not even make eye contact, much less smile or speak for that matter. For a moment I thought, ok maybe I look scary? Maybe I come off really intimidating! Maybe I wasn’t speaking loud enough? So the next time I smiled it was to a man carrying a giant blanket who looked like he hadn’t gotten a good nights sleep in quite some time. I smiled at him and the edges of his mouth turned up and he perked a small smile too. At that moment I felt like we connected if only for a flash. We shared a joy filled moment and I wonder if someone you come across could use a moment like that too? Do people smile at you when you cross the street? Do you smile when you walk down the street? It’s that ole adage, if you’re happy and you know it then your face will surely show it. 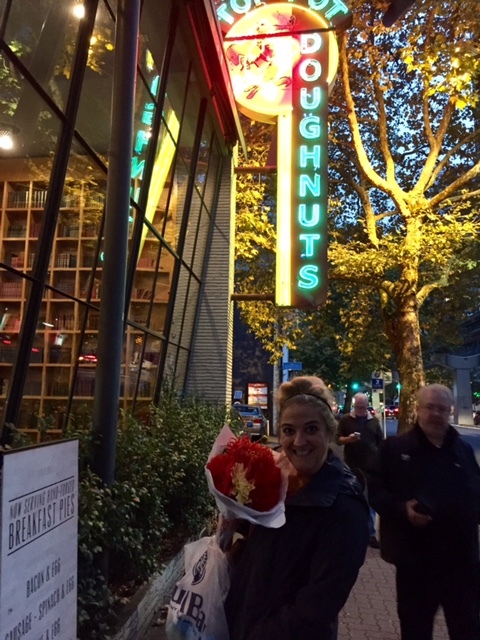 Try the chocolate cake doughnut at Top Pot Doughnuts, it’ll make you smile! And pick up some beautiful Seattle grown flowers at Pikes Place Market one of the oldest most continuously run farmers’ markets in the US.